My family is Jewish. We don’t celebrate Christmas. And yet, I had three Christmas traditions as a kid that remain my warmest memories of Christmas. Midnight Mass from St. Peter’s Basilica — I think that I probably started staying up to watch this so that I could spend extra time with my dad. Over the years, however, I came to love the ritual and annual message from the Holy See. Spending Christmas Day at my friend’s house — I loved being included as my friend’s family gathered around the tree and opened gifts. They always had a gift for me (Cherry Lifesavers) and there was lots of laughter and cookies and love. KBIG104’s Christmas Playlist — for 36 hours, the radio station would play Christmas music and the playlist was published ahead of time in the LA Times. I would actually set my alarm for the middle of the night to hear a favourite Christmas carol. As a little Jewish girl, these activities helped me appreciate the beauty of this sacred holiday. Though I live far away from my childhood friend, not a single Christmas passes without me thinking of her and her parents, brother, and nana, and how they welcomed me into their home each year. Making visiting Christmas a lovely experience at a time of year that often feels exclusionary. Sometimes…I long for those innocent moments. Great reflections. I think all Jews have some sort of Christmas traditions – if for no reason more than we always have school off then. While I remember caroling, decorating trees, and, of course, Chinese Food and a Movie (at one time seemingly the only 2 things open on Christmas), my biggest Christmas tradition last into adulthood. Other Jewish friends from Youth Group and I would get together for a massive game of Risk. While a game based on world conquest may be at odds with the holiday, it was the only time we had enough time to play out a full game. They’d be collusion and deception and plenty of poor losers and winner. We continued it when we could as adult until people started getting married and having kids. I consider those activities, like my own annual Chinese dinner and movie, to be experiences that are expressions of my outsider identity. Interestingly, listening/watching Midnight Mass and Christmas carols are things I do as a person of faith. A different faith, to be sure.. But I consider them different from Chinese dinner and a movie. Thank you so much for your reflections. I miss Christmas too for different reasons. I’m a convert and a happy MOT. For some reason, I know not why, this year produced some yearnings for Christmas I thought were put away. It’s so good to hear that I’m not alone and I can quit feeling guilty! Happy Chrismakkah. I really think it’s because of the confluence of the two holidays. It felt strange to have them overlap this year. I much prefer when Christmas falls later so that they are completely separate. Happy Hanukkah to you and your family!! Nowadays, it seems that many Jews are celebrating Christmas alongside Chanukah in their homes. I imagine the children in these households do not have nearly sense of “otherness” at this season that prior generations felt. I wonder what effect this will have on their Jewish identity in adulthood. 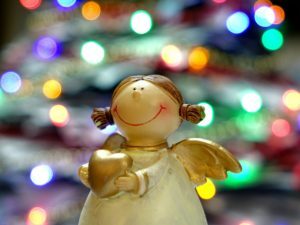 If I am not mistaken, in that course, I believe you talked about how you can understand and accept or feel close to (my words) Christmas as a religious holiday, as opposed to the commercialism of it, something like that, which had an effect on me…. Beautiful memories and yes–we do end up with our traditions for the day (and night before) even if they’re not by a tree or in a church. I like this time of year! So happy to see your words here!